From the earliest editions of newspapers, the general public has been given an opportunity to put forward a point of view through ‘Letters to the Editor. In this way, we can discover much about the lives and loves, concerns and problems faced by the inhabitants of 19th century Ryde. The advertisements which appeared in the papers also tell us much about the way they lived. Through this wonderful resource, available in the County Record Office, we are given a complete snapshot of the town as it used to be. Leisure activities, shopping opportunities, reading material available at the library, fashions of the time, favourite foods – all are displayed on these pages. From the advertisements of House Agents, we can see what items of furniture were fashionable and learn of the impact of new technology such as the typewriter, tin opener and the latest craze in the 1870s- roller skating! 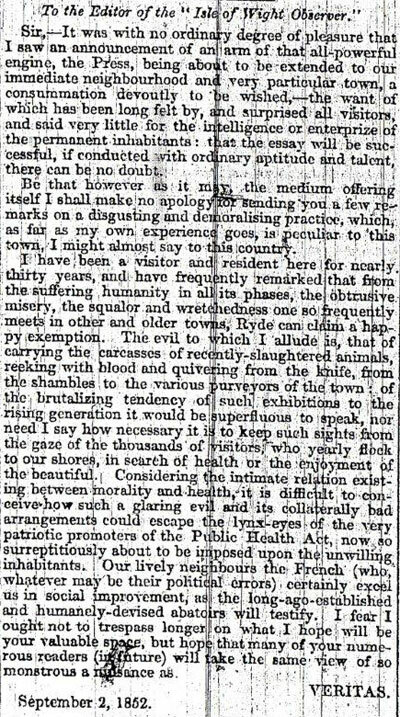 On this page we will add letters written to the newspapers revealing issues of importance in 19th century Ryde. A very lengthy letter with strong views about the introduction of Turnpikes on the Island appeared in the Hampshire Telegraph on January 22, 1813. To read this epistle, click here. I hope the author felt better having got it off his chest!!! This letter appeared in the Observer of September 4, 1852 – the first issue of the established newspaper. Link to transcription.